Another Spill in San Francisco Bay. Where Do Albatrosses Find the Plastic? How Will the Swiss Find the Water? There has been another oil spill involving bunker fuel in San Francisco Bay, again south of the Bay Bridge. The spill occurred at 6:48 a.m. as a barge pumped fuel into the tanker Dubai Star 2 1/2 miles south of the bridge, officials said. Emergency crews were scrambling to contain the oil slick and prevent it from reaching shore, where it could harm wildlife. After realizing what had happened, the ship's crew shut off the source of the spill, officials said, but the oil had already spilled onto the Dubai Star's deck and poured into the water, where it was drifting with the tide. The Dubai Star is a Panamanian-flagged vessel built in 2007. It is owned by South Harmony Shipping Inc. of Panama and was carrying light jet fuel as cargo as it headed into the Bay Area. The fuel that spilled was propulsion fuel, not the ship's cargo. A similar incident occurred almost exactly two years ago. Yesterday's spill appears to be smaller, and the Coast Guard was notified of the incident much faster, so it is possible that environmental effects will be less severe. This article reports that the International Bird Rescue and Research Center is prepared to rehabilitate up to 2,000 birds. So far no bird injuries have been reported. The IBRRC has its own update on the situation. The temperatures become colder and we have been getting a lot of rain lately, but that does not mean moths are done for the season. Just this week, another one showed up in the yard. This one gave me some identification trouble at first because I thought it belonged in a different subfamily. Once I figured out that it belonged in Xyleninae and not Hadeninae, the identification fell into place pretty quickly. I have included a second view from above because I think my camera shows more accurate color when I do not use the flash. There are several sallow moths that persist late into autumn. I believe this one is a Variable Sallow, which has a heavy subterminal band on its forewings with lighter areas on either side. A similar late season species is Bicolored Sallow, which differs in having a dark median line in addition to the subterminal band. An interesting characteristic of Variable Sallows is that, unlike most moths, they are active from October to May. They have one generation per year and overwinter as adults. Its larvae feed on basswood, cherry, and oak; the latter two are present around the yard. There is a good chance I will see more of these in the coming months. Here is one final shot to show the moth's underside. A recent study found that migratory European robins can sense direction using light-sensing cells in their eyes. Previous studies (in different species) had suggested birds can sense the Earth's magnetic field with iron particles in their beaks. In the past week, thousands of birds have died off the Pacific Northwest because of an algae bloom. Over 450 were taken to the International Bird Rescue and Research Center for rehabilitation. The migration route of Eleonora's Falcon has been documented using satellite tracking. The falcons fly from northern Africa directly across the Sahara on their way to Madagascar. An unusual feature of this species is its ability to migrate by both night and day. Most of the UK's 63 rare birds have increased their populations over the past decade thanks to active conservation programs. A gallery of some rare species is available here. About 80 distinctive Australian birds are in trouble due to habitat destruction and climate change. Twenty-two rare bird species have been documented in a rugged mountain forest on Timor Island. The American Bird Conservancy is pushing a program to reforest parts of Appalachia as a potential green jobs program. Among the potential beneficiaries would be declining forest species such as Cerulean Warblers. The capture and sale of Atlantic bluefin tuna, used for premium sushi, may need to be banned entirely if the species is to avoid extinction. The Union of Concerned Scientists is publishing reports on regional impacts from climate change in the U.S. Here are the ones for the Northeast. Despite opposition to cap and trade legislation from the agricultural sector, farmers can expect severe consequences from unrestrained climate change. Climate change also poses a severe threat to the 80% of Australia's population that lives in coastal areas. The Senate started hearings on cap and trade legislation this week. A scientist has been studying black bears up close and claims they are less dangerous than advertised. In British Columbia there have been 48 control kills of grizzly bears per year over the past fifteen years. Most deaths were probably preventable. RealClimate has an open letter to Steve Levitt regarding the problems with the climate change chapter of Superfreakonomics. Walk the Wilderness has posted I and the Bird #112. 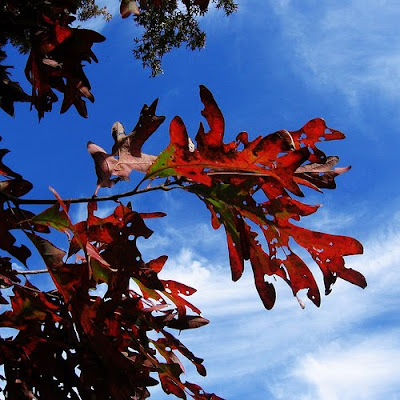 This White Oak was changing from its summer green to its autumn deep red. The blue sky reflects the weather conditions of the beginning of the week, not the middle. Most readers of this blog have probably already seen Chris Jordan's sad photos of dead albatross chicks that ingested too much plastic. The albatrosses featured at that page were found on the Midway Atoll. Their parents found bits of plastic, thought they were food, and brought them back to feed to their chicks. Some albatross chicks regurgitate the plastic later, but many suffer detrimental effects. A chick that ate too much plastic would eventually starve to death, as these chicks did. So where do they find the plastic? Albatrosses forage by wandering great distances over the ocean and picking up likely prey items. The bits of plastic were most likely floating in the well-documented garbage patches of the Pacific Ocean. A new paper in PLoS ONE suggests that the problem for Laysan Albatrosses is far worse in the western Pacific than in the eastern Pacific. The authors studied two albatross breeding populations, one at Oahu in Hawaii and the other at Kure, 2,150 km to the northwest. They tagged adults in each colony with geolocators to track their movements during and after the breeding season. As the chicks fledged, they collected and examined the chicks' boluses, regurgitated material that includes any non-digestible items that the chicks swallowed. This could include bones, beaks of squid, or plastics. Data from the geolocators showed that the adults from the two colonies foraged in different parts of the Pacific. The Kure colony mostly foraged to the north and west of Kure; Oahu albatrosses foraged to the north and east. Contours show the foraging ranges for albatrosses on Kure Atoll (blue) and Oahu (red) during the a) incubation b) chick guard c) post-guard and d) non-breeding stages. Examination of the boluses showed that chicks on Kure ingested and regurgitated a far greater amount of plastic than chicks on Oahu. 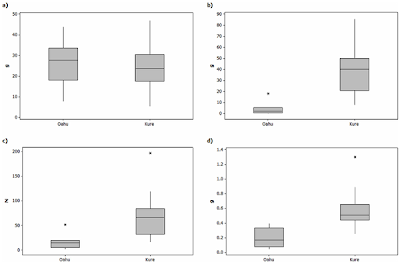 Comparison of a) natural food mass, b) plastic mass, c) # plastic pieces and d) average plastic piece mass from Laysan albatross boluses on Kure and Oahu. The finding that birds breeding on Kure Atoll fed their chicks, on average, ten times more plastic than birds breeding on Oahu suggests that putative Western Garbage Patch where the majority of Kure birds foraged may in fact be a just as much of a threat to marine life as the frequently discussed Eastern Garbage Patch. Furthermore, every bolus examined from Kure Atoll contained multiple pieces of fishing paraphernalia, while only two boluses on Oahu contained any evidence of fishing line or tools (despite recreational fishing adjacent to the breeding colony on Oahu), suggesting that the threat from fisheries not only comes from bycatch for this species but also from the consumption of fishing gear. It is unclear whether the Western Garbage Patch contains more trash than the Eastern Garbage Patch, or if the size and composition of the pieces are easier for the birds to ingest compared to those found in the Eastern Garbage Patch in addition to the finding that albatrosses from Kure spend a greater proportion of time foraging in this area. The authors also raise a third possible explanation. The colony at Kure has a higher population density, so adults there may need to be less selective in choosing food items. Whether this will help scientists prevent albatrosses from ingesting so much plastic remains to be seen. There is such a tremendous amount of plastic floating in the Pacific that there seems to be little hope of removing it. Perhaps someone will find an alternative solution. In the long term, reducing plastic use and plastic waste should cut down on albatross deaths. My hope is that albatrosses will eventually learn to distinguish plastic from food. Images are reproduced from PLoS ONE and link to the originals. Yesterday's post on potential health problems from climate change touched on the threat of increased droughts. Another study quantifies what that might mean in a European context. Switzerland would have to irrigate up to a quarter of its farmland. The Swiss federal agricultural research station Agroscope said about 10 times more land would need to be irrigated to avoid lost harvests, some 400,000 hectares (988,000 acres) instead of the 38,000 hectares that currently receive regular irrigation. But researcher Jurg Fuhrer told AFP that such huge irrigation to cope with more frequent drought might not be economically viable or feasible. Twenty-six percent of usable agricultural land and 41 percent of arable land is at risk due to the drier climate that has been emerging in recent years, the scientific study found. Climate research cited by Agroscope has indicated that summer rainfall in Switzerland could be cut by up to a fifth by 2050. Agroscope predicted that three months of sun without a drop of water would become a common feature for Swiss summers -- comparable to the severe European heatwave of 2003. Presumably some of the irrigation water can be sourced from nearby rivers, such as the Rhine or Rhone rivers mentioned in the article. The trouble is that if neighboring countries are facing similar problems, there may be a limit to how much one country can draw. Plus, with a drier climate, chances are that the volume of water would be reduced from current levels. The heatwave from 2003, by the way, resulted in more than 37,000 deaths and a substantial reduction in agricultural production. I grabbed a handful from one of the plants. As I continued along the path, I let them go one by one. The light breeze caught them, and I enjoyed watching them drift off into the field and fall among the other plants. If the seeds sprout they might become food for Monarch butterflies and other insects next summer! A new report by the Trust for America's Health identifies ways in which climate change might affect human health. The idea that climate change could threaten human health is not a new one, but it mostly has stayed below the surface of public discussion. The report is a useful reminder that climate is not just about melting ice or drowning polar bears (as important as those issues are). -- Heat waves, which the report says are expected to increase. The danger is expected to be worst, the report said, in concrete-clad cities, where the lack of greenery creates an "urban heat island." Under climate change, the experts said, summer heat could also sneak up on people in cities where air conditioning hasn't been needed in the past. -- More "extreme weather events," such as hurricanes, floods and wildfire-breeding droughts. Drought could also create crop failures, the report said, leading to malnutrition. -- More widespread diseases carried by mosquitoes, ticks and other pests. If warmer temperatures allow these animals to expand their ranges northward, the result could be more cases of West Nile virus, Lyme disease and hantavirus. -- Increased air pollution, caused because heat contributes to the formation of smog. This, the report said, could increase the incidence of severe asthma or pulmonary disease. Among those things, I would guess that droughts have the biggest potential impact in the near future. The water supply is already in trouble in many western states, with regular restrictions on water usage. Adding hotter temperatures and more frequent droughts on top of existing conditions could create a crisis situation. If more frequent droughts disrupt our food supply as well, the combination of water and food shortages could disrupt American politics in ways that are difficult to predict. You can read the full report at the Healthy Americans site. In last week's SkyWatch post, I mentioned that we were in the midst of the early stages of fall. 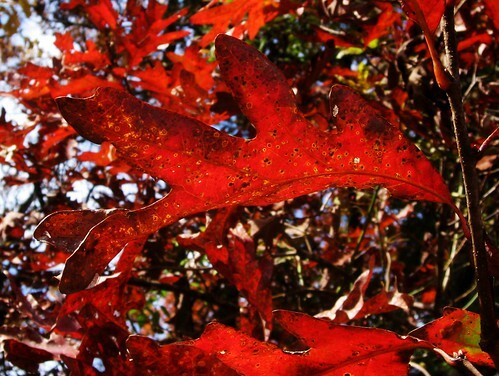 While some maples were at or near peak, most oaks and Norway Maples had barely begun to change. It turns out I spoke to soon. Yesterday at the Griggstown Grasslands Preserve, many of the White Oaks were already changing, and even some Red Oaks and Pin Oaks were showing some fall color. Below is a White Oak. Those photos link to larger images on Flickr. A new study of Greater Sage Grouse predicts that continuing energy development along current lines would lead to a 7-19% reduction in the Greater Sage Grouse population. Sage-grouse populations are considered indicators of ecosystem health and have been closely monitored by state game and fish agencies over the past decade. The greater sage-grouse is currently a candidate for Endangered Species listing -- a result that would have far reaching implications for a wide range of industries in the region. 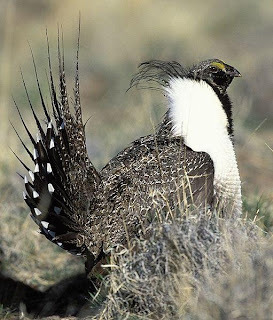 "Sage-grouse are useful in prioritizing conservation because their abundance is indicative of large and intact shrub-dominated grasslands, the most endangered ecosystem in North America," said study co-author, Dr. David Naugle, Associate Professor, University of Montana. "Challenges with sage-grouse are a harsh reminder that the value of small-scale conservation actions may be negated if large-scale cumulative impacts are ignored." The new study and its detailed maps of the Intermountain West indicates that future oil and gas drilling could impact up to 9.1 million acres of sagebrush shrub lands and 2.7 million acres of grasslands -- key sage-grouse habitat. How to balance energy production and the welfare of Sage Grouse and other grassland animals is a pressing issue. Demand for energy is constantly increasing due to population growth and new technologies, as well as economic development elsewhere in the world. Since 1950, energy demand has increased by 50%, and the same increase is expected over the next two decades. As a result, governments and the energy industry feel the need to expand energy production into areas where it would probably be better if they did not go. Drilling on the grasslands of the intermountain west is detrimental to a variety of grasslands specialists, especially the Greater Sage Grouse. It would be better for the energy companies if they could figure out how to reduce their impact on grasslands now. If not, Greater Sage Grouse will have to be listed as an Endangered Species (it probably should have been listed already), and more severe restrictions will have to be set until the population is stable again. Unfortunately this press release does not offer any suggested solutions; I am not sure if the authors of the study do. Yesterday, October 24, E.B. Forsythe National Wildlife Refuge, known to Jersey birders as "Brig," celebrated its 70th birthday. The Brigantine Division, which includes the well-known wildlife drive, was founded in 1939 to preserve coastal wetlands in Atlantic County. At that time wildlife refuges primarily catered to hunters; Brigantine was intended as a migration and wintering stop for waterfowl. Later a separate refuge was created to protect wetlands around Barnegat Bay. The Brigantine and Barnegat refuges were combined and renamed for Congressman E.B. Forsythe in 1984. As birding grew in popularity, Brigantine quickly established itself as one of the top birding attractions in New Jersey, and perhaps on the East Coast. Its tidal impoundments and salt marshes attract large flocks of shorebirds during migration seasons and waterfowl in the winter. It also serves as a breeding spot for Osprey and Peregrine Falcons, both of which used to be on the federal Endangered Species List. In summer it gathers large numbers of terns, herons, and other coastal breeding season specialties. The same features that attract common species make Brigantine attractive for uncommon and rare species as well. Jennifer has a list of the rare birds found at the refuge since the 1960s. Despite the refuge's reputation as a rarity magnet, I have only seen four life birds there. Two were on my first trip to the refuge in 2004: Black Skimmer and Cattle Egret. The other two, Whimbrel and Roseate Spoonbill, came this summer. The latter, Roseate Spoonbill, is one of the most spectacular birds I have ever seen. As my own tribute to Brig, I am including below a few of the photos I have taken there. Some of these probably appeared on this blog already. All images link to larger versions on Flickr. Controlling mercury is significant because the pollutant enters the food chain and ends up in fish. Children, including those who were exposed to mercury before birth, are especially at risk of developmental and learning disabilities. Adults also can experience health problems from eating too much contaminated fish. Although the EPA has issued guidelines about eating fish, it hasn't required power plants to reduce toxic emissions. The Clinton administration, before leaving office, declared that plants should be subject to controls under the Clean Air Act, but the Bush administration reversed that decision. Instead, it set up a cap-and-trade system, which imposed limits on emissions and established a system to trade pollution allowances. In February 2008, however, a federal appeals court overturned that approach and ordered the EPA to regulate toxic air pollutants from power plants. Then the American Nurses Association and environmental groups sued to compel the EPA to issue the regulations. Reducing mercury pollution should also benefit birds, and not just ones that eat fish. Some previous studies have found mercury (and its more toxic byproduct methylmercury) in Wood Thrushes and other songbirds. Similar to the way that humans ingest mercury via contaminated fish, songbirds ingest mercury via invertebrates. Unfortunately we have to wait a little longer for the rules to take effect. The EPA plans to issue the new mercury regulations by 2011. Most likely companies will have a grace period to install scrubbers so those regulations may not take effect until 2015 or so. Still, this should mean big improvements in air quality and food safety. Golden Eagles have also been filmed hunting reindeer in Finland. A film crew followed a reindeer herd during its winter movements and recorded several attempts. It seems that hunting reindeer is mainly attempted by immature eagles. The Sierra Club recommends shutting down the lights at night to make skyscrapers safer for migrating birds. The Dominican Republic designated a new wildlife refuge for migratory and resident birds. Seabirds and other marine animals are getting killed by exposure to the toxic oil spill in the East Timor Sea. Oil has been leaking from a drilling rig since August 21, and attempts to patch the leak have failed. The EPA registered the rodenticide Rozol to kill prairie dogs even though it could cause secondary poisonings if birds of prey eat poisoned prairie dogs. The current issue of National Geographic has some great photographs of kingfishers, including one shot underwater. Chris Jordan has photographs of a young albatross that died from eating too much plastic. After a decade of drought, the woodland bird population in Victoria (Australia) is collapsing. This writer praises dogwood trees for attracting birds. A gull walked behind an Australian news anchor reading a serious report, illustrating the perils of live traffic cams. Today in NJ Birding History: Bird Documentation in the Digital Age: What Is a Bird Record? The Interior Department plans to designate 200,000 square miles as critical habitat for the 3,500 polar bears in Alaska. Polar bears are threatened primarily by the disappearance of sea ice due to global warming. Meanwhile the state of Alaska is still trying to get polar bears delisted. Many of the 120 reported frog extinctions since 1980 were caused by a fungus (Batrachochytrium dendrobatidis) that kills frogs by preventing the flow of electrolytes across the frog's skin, leading to heart attacks. A lake on Baffin Island is undergoing changes in chemistry due to climate change. The D.C. Council is considering legislation to regulate the removal of wild "nuisance" animals. The council wants to property owners to use relocation rather than lethal control where possible. Bowdoin NWR in Montana is trying to reduce the salt levels in the refuge, which have been increasing due to drought and excess irrigation. The Center for Biological Diversity has a website profiling 350 species threatened by climate change. The US Army Corps of Engineers plans to restore 35 acres of salt marsh in Jamaica Bay. The Senate approved Marcia McNutt as USGS Director and science adviser for the Interior Secretary. Sometimes the best way to appreciate fall foliage is by looking up. When leaves are backlit by the sun their golds and reds look even brighter than the whole tree does at a distance. The crooked shapes of the branches stand out more too, in contrast to the bright leaves and sky. In central New Jersey, we are in the midst of the first wave of color changes. Right now Sugar Maples and Honey Locusts are at their peak, and Red Maples and dogwoods are close. Most oaks and the invasive Norway Maples have not turned yet. In time, those will change too, the oaks to deep reds and the Norway Maples to pale yellow. Of course, not every tree is changing; some of them are dead but still majestic like this Black Walnut. More photos are my Flickr account. Song Sparrows (Melospiza melodia) are one of many bird species with complex songs and other vocalizations. Previous research shows that these sparrows learn most of their repertoire. While the ability to sing is innate, the precise songs are not. They learn most of this repertoire during their first year, between the time they leave the nest and the time they migrate. A new study adds some more detail to the picture: young sparrows learn by listening to vocal exchanges among their elders. For the field study, the researchers radio tagged 11 male sparrows in Seattle's undeveloped Discovery Park. These birds were about two months old and had not yet begun to sing. The park has a year-round resident population of approximately l50 breeding pairs. To test a young bird's reactions, it was first located by its radio signal and then the speakers were placed about 50 yards from the animal's location. Finally the bird was exposed to five minutes of pre-recorded song, either from pairs of song sparrows, a sparrow and a chickadee (effectively a solo sparrow) or a pair of chickadees (the control condition). All of the sparrow recordings were from birds that were no longer alive, so that the songs the young birds heard were not familiar. Chickadees commonly live in the same habitat as song sparrows, so sparrows are familiar with their songs. That the juvenile birds approached the simulated interaction of two song sparrows but largely ignored the solo singing of a song sparrow lends support to the social eavesdropping hypothesis proposed by Beecher. This theory says young birds learn to sing by eavesdropping on singing between adult birds, rather than listening to a single bird or directly interacting with an adult. The abstract for the study is here. 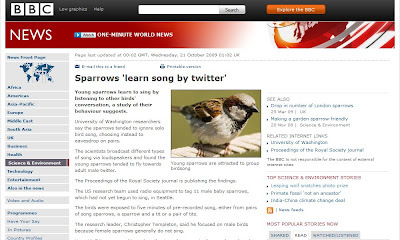 As a side note, American birders will note that the BBC article on this Song Sparrow study contains an egregious taxonomy error. Yesterday I reached a personal milestone in my eBird usage. One of the features that makes eBird such a compelling site is that the ability to set up personal birding locations and generate bar charts and other abundance graphics for them. If you have a local patch, this feature makes it possible to monitor how many species you have seen at the location and when individual species have arrived or departed in the past. It also provides some additional motivation for birding there. Each new checklist makes the chart more complete and adds better abundance data to make it more useful. As Nate wrote, the charts start to look like real abundance charts in a very short time. Bar charts are divided into months, which in turn are divided into quarters that more or less correspond to the weeks. (The last "week" in each month usually has more than seven days, since it stretches from the 22nd to whatever day the month ends, whether that be the 28th, 29th, 30th, or 31st.) Each checklist either fills a new week or adds sightings to a week that already had data. The bar chart can pull checklists from as many years as you want; the default is 1900 to the current year. After I did my usual bird walk in my local patch (Donaldson Park) yesterday, I entered a checklist and checked the bar chart for the location. That checklist had filled the last remaining gap on the bar chart for my local patch, so that now every week of the year is represented by at least one checklist. 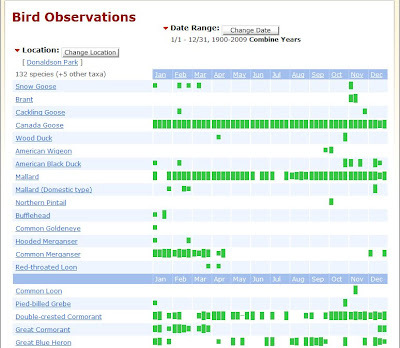 The top portion of the bar chart is below; click through for a screenshot of the full page and species list. Over the past few years I have recorded 132 bird species in the park. The only species I have recorded for every week of the year is Canada Goose. 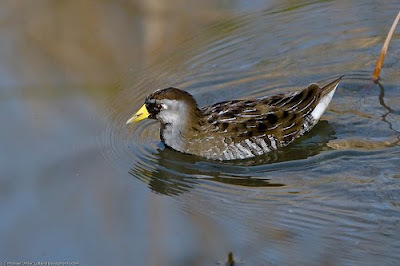 I have seen other common species like Mallard, Ring-billed Gull, Herring Gull, Great Black-backed Gull, Mourning Dove, American Robin, European Starling, Song Sparrow, and House Sparrow during most weeks but missed them occasionally. There are also a few species like Killdeer that are present on almost a daily basis for most of the year but depart for a few months at a time. The list also includes a few relative rarities like Iceland Gull, American Pipit, and White-crowned Sparrow. My bird walk yesterday included a mix of the regular birds and some migrants. The best bird was a White-crowned Sparrow at the east end of the park. It was only the second time I have seen on in that park, or in the county. There were also small flocks of Savannah Sparrows, Yellow-rumped Warblers, and Chipping Sparrows, in addition to a few Ruby-crowned Kinglets. In some ways the most impressive sight was a huge flock of Herring Gulls, a little under 800 strong by my estimate. Especially with such a beautiful afternoon, this walk turned into a great way to fill the last gap. Though I have had some success with identifying dragonflies, I am still at a loss when it comes to many damselflies. Some I can easily recognize, like the beautiful Ebony Jewelwing, but others so closely resemble each other that I end up leaving most unidentified. Here are two examples. The first is clearly a spreadwing, one of several species of large damselflies that perch with their wings spread rather than folded over their backs. The best match I have found so far is Slender Spreadwing, though it also resembles others among the ten possible species in the state. I photographed this one at Leonard J. Buck Gardens at the beginning of September. I am not even sure about where to place the second. It seems most likely one of the bluets, which I find to be one of the hardest odonate genera to separate. I photographed this one in late August at Cape May Point State Park. If you happen to recognize either of these, feel free to comment. The pictures link to larger versions on Flickr. These are a few dragonflies I photographed around the end of August and beginning of September. The first two are Eastern Pondhawks (Erythemis simplicicollis), one male and one female. It is common around wet areas, though I have sometimes seen it in meadows as well. For a brief period towards the end of August, these seemed to be the most common species that I was seeing. I find the females the more distinctive of the pondhawk sexes. I photographed both male and female at Cape May Point State Park. The next is a Blue Dasher (Pachydiplax longipennis), photographed at the Nature Conservancy's South Cape May Meadows refuge. It is another common dragonfly around ponds and wet areas. This may be the dragonfly I see most frequently throughout the summer months, even if others are more eye-catching. I like the way that Blue Dashers curl their abdomens when they perch. Some curl even more than this one was doing. Above is a Carolina Saddlebags (Tramea carolina), named for the prominent markings on its hindwings. This species can be difficult to separate from Red Saddlebags, using markings not visible in this photo. When I took this photo I was standing directly underneath the dragonfly. It seemed to struggle to cling to the branch in the stiff Brigantine breeze and kept shifting its position to find a better grip. The last in this series is an Autumn Meadowhawk (Sympetrum vicinum), photographed at Leonard J. Buck Gardens. This species peaks in New Jersey in September and is one of the most commonly seen fall dragonflies. In fact, they have been reported as late as December in warmer years. Skippers, as a group, are among the most difficult butterflies to identify. Most of them have some variation of pale orange with dark brown markings, and occasionally a white spot or two. Skippers can be identified more easily if you know what is flying. This is not always obvious from field guides since the peak dates vary by region. It seems that the best way to learn is by watching skippers over a few seasons. These skippers are a few that I photographed near the end of August and beginning of September. This first is a Sachem (Atalopedes campestris), a common skipper in late summer and fall. Sachems always leave me a little uncertain because their markings seem especially cryptic, even for skippers. I usually try to eliminate other possibilities as best as possible before settling on an ID. This Sachem is nectaring at a butterfly bush. The second is a Little Glassywing (Pompeius verna). These are dark butterflies with white spots on the wings. According to my field guide, the white markings just below the tips of the antennae are a distinctive field mark. That helps a lot since the rest of this skipper's markings do not seem all that distinctive. The last is a Zabulon Skipper (Poanes zabulon), a common late summer skipper. This is probably the skipper species I see most in August. Since August I have seen mostly Sachems. The Kaufman guide shows a yellow spot surrounded by brown at the base of the wings; this seems to be a feature only of the hindwing. I like how this skipper has its proboscis rolled up. In some photos before I took this one, it was nectaring at the phlox. Late August and early September proved to be a productive period for me to find interesting moths. I think this has less to do with seasonal abundance than with my observation skills. With small creatures that appear for only part of the year, I find that I have to retrain my eyes and ears to their movements and sounds. This is as true of small birds like warblers and sparrows as of insects. I had not looked at moths very closely prior to this summer, so it took time to recognize them in the field. The following are a few more moths that I photographed towards the end of the summer. The first is a caterpillar of the Salt Marsh Moth (Estigmene acrea). According to the account at BugGuide, these caterpillars are highly variable, from dark like this one to much lighter colors. (The photo in the Kaufman guide is of one of the lighter varieties.) Despite their name, Salt Marsh Moths will live in a variety of open habitats, like grasslands, waste areas, and marshes. I found this one in a salt marsh near Tuckerton, home also to a small flock of Saltmarsh Sparrows and large swarms of greenheads and mosquitos. Salt Marsh Moth caterpillars can be identified by their distinctive hair tufts, but the most remarkable hair tufts belong to another group of moths, the tussock moths. The caterpillar above is a White-marked Tussock Moth (Orgyia leucostigma), which apparently is named for white spots on adult males rather than the caterpillar's tufts. Adult females of this species are flightless. Hair tufts are common on other tussock moth caterpillars, such as the Sycamore Tussock Moth and Milkweed Tussock Moth previously featured here. The hair tufts may cause allergic reactions, so use caution if handling one. Unlike the others, the last moth is in its adult form. I found this Black-bordered Lemon (Thioptera nigrofimbria) in one of the fields at Higbee Beach WMA. It was early in the morning so the grass was still covered with dew. This one was flitting around in the tall grass; its larvae feed on morning glory and crabgrass. Adults have four black spots on their wings and take their name from the black borders of their wings. On this individual, much of that black border has been worn down, especially on its right forewing. Reflections on the Catawba has posted the seventh edition of The Moth and Me, a blog carnival devoted to moths. One of my posts, on a Chickweed Geometer, was included in the batch. The next edition will be hosted by Wanderin' Weeta; contact Seabrooke for future hosting opportunities. Twelve endangered puaiohi, or small Kauai thrush, were released on Kauai in Hawaii after being raised in captivity at the San Diego Zoo. The release is part of an effort to boost the species's population. Before it became a hawk-watching site, Hawk Mountain was a popular place for hunters to gather and shoot migrating raptors. That stopped 75 years ago thanks to the work of Rosalie Edge. Many bird species, especially kestrels, have been documented sharing nest boxes with barn owls. The reason for this is unclear, though it may be linked to a shortage of nesting cavities. Noise pollution is a growing threat to biodiversity because many species, birds especially, have evolved sensitive hearing to help them forage or find mates. Ospreys raised in Scotland were tracked by satellite as they migrated to Africa. The EPA announced that two bird-killing pesticides, disulfoton and methamidophos, will be removed from the US market. 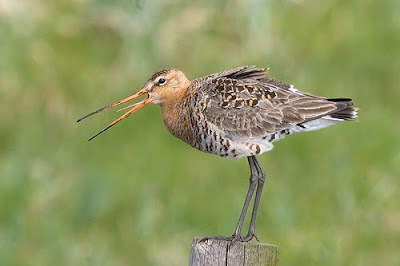 Salt marsh birds are threatened by climate change. The Cape Cod Times runs down a list of plants that can be helpful to birds. Fruit-bearing native plants can provide food for birds and for insects that birds might eat. The LA Times has a list of the 20 least-visited national parks according to last year's numbers. The list includes some well-known birding hotspots. Lounge of the Lab Lemming: Have you seen this bird? Some "scrubbers" that remove pollutants in power plant smokestacks cause serious water pollution instead. During the 19th and 20th centuries glaciers trapped many air and water pollutants in the ice; now that the glaciers are melting, those pollutants are getting released once again. Contractors at the closed Hanford nuclear weapons plant in Washington state must track down radioactive rabbit droppings to complete a thorough environmental cleanup. Rabbits had burrowed in contaminated parts of the site and then left their droppings in other areas. After two attempts, Australia has still not managed to fix a leak in an oil drilling rig in the Timor Sea. Hundreds of barrels of oil per day have been spilling from the leak for two months. Freshwater species currently face an extinction rate that is 4-6 times the extinction rate for land or marine species. That seems likely to worsen because of human freshwater consumption and climate change. Five large nonnative snake species pose a major threat to invade U.S. ecosystems: Burmese pythons, northern and southern African pythons, boa constrictors and yellow anacondas. Four other species pose lesser but still serious risks of invasion. The Arctic Ocean could have ice-free summers within ten years. This photo is from the garden at Hereford Lighthouse in North Wildwood. It shows Large Milkweed Bugs (Oncopeltus fasciatus) and their nymphs crowded on the seed pod of a milkweed plant (Asclepias sp.) against a gorgeous blue sky. Now that we are well into the fall season, such sights are becoming much more rare, but there are still a few around if you look. I and the Bird #111 is now online at Twin Cities Naturalist. Go visit to read the latest great posts from around the bird blogosphere.